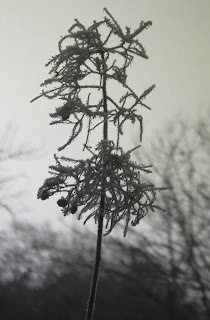 A rather belated Happy New Year for 2012 and what a contrast of weather we've had in Brittany in just three weeks... 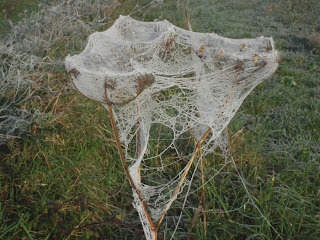 I'm confused, so it must be even more confusing for the poor plants let alone the birds - at this rate they'll be starting to nest! This cold weather finally left today but we've had about 5 days of beautiful sunny days, clear blue skies and white frost everywhere for about half of the day - some areas of the garden that don't get much sun at this time of year have been frosted over all day. 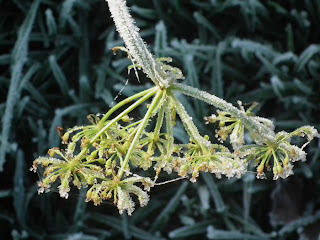 This cold weather finally left today but we've had about 5 days of beautiful sunny days, clear blue skies and white frost everywhere for about half of the day - some areas of the garden that don't get much sun at this time of year have been frosted over all day. 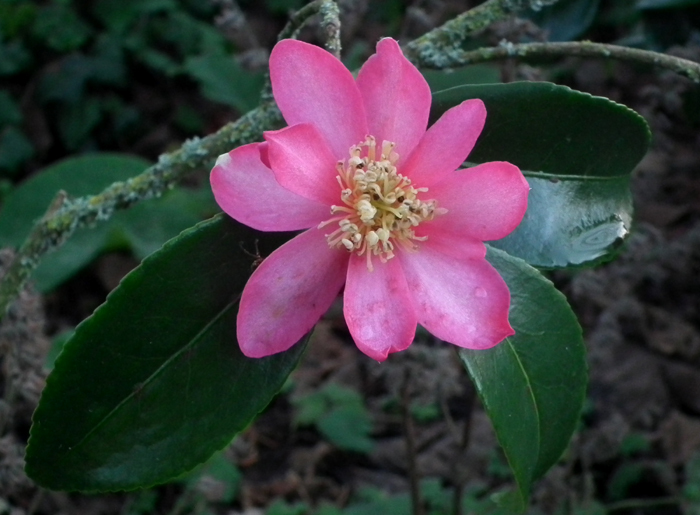 A few days ago I'd been around the garden taking pictures of all the plants in bloom and for the beginning of January we've an interesting mix already. 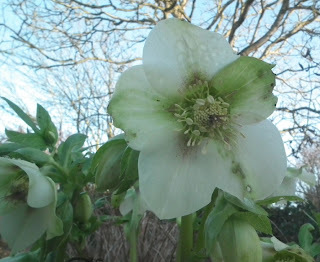 The Helebores never disappoint and couldn't imagine the garden without them. 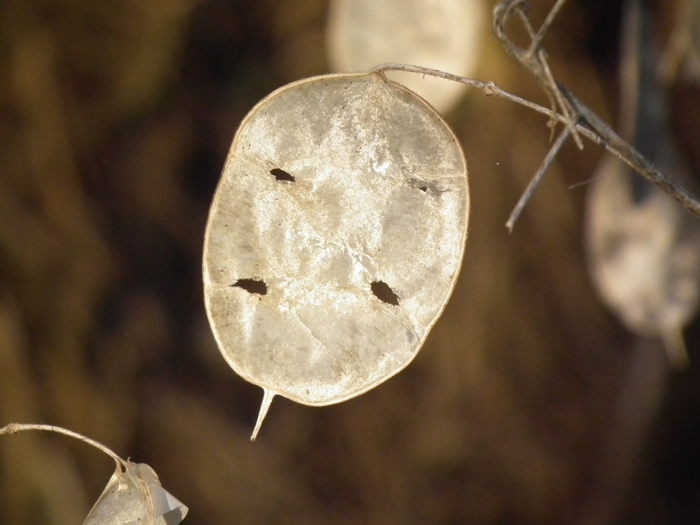 One word of advice though, if you don't have a large garden and you don't want your beds over run with Helebore seedlings it's advisable to cut back the seed heads before the set seed! 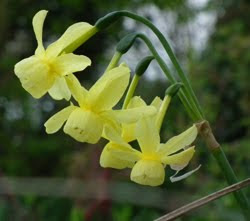 If you do have the space though it's great to see all the cross bred varieties that you end up with. 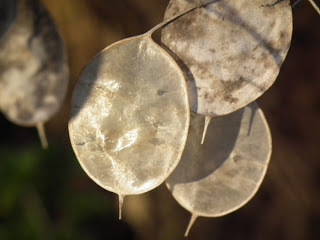 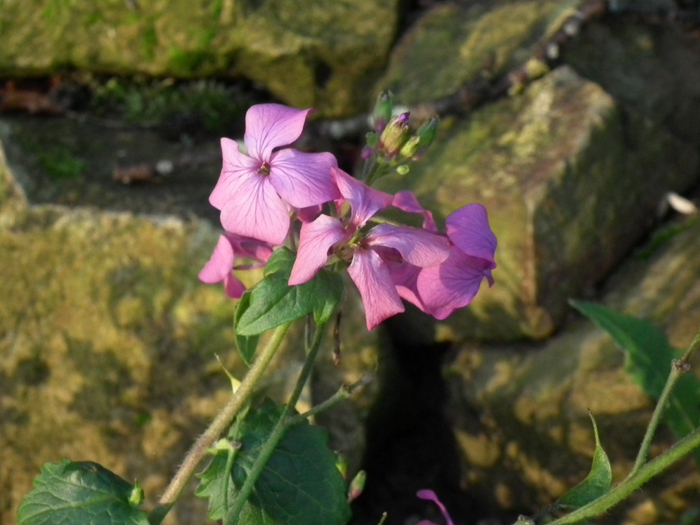 Another tip is to cut back the large leaves that they produce before the main flowering starts - that way the flowers have the chance to grow more upright and a bit taller too giving a much better display. 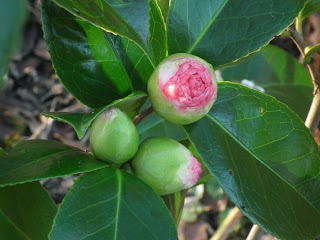 I'm also v. pleased to see the developing Camellias this year - SO much earlier than usual. 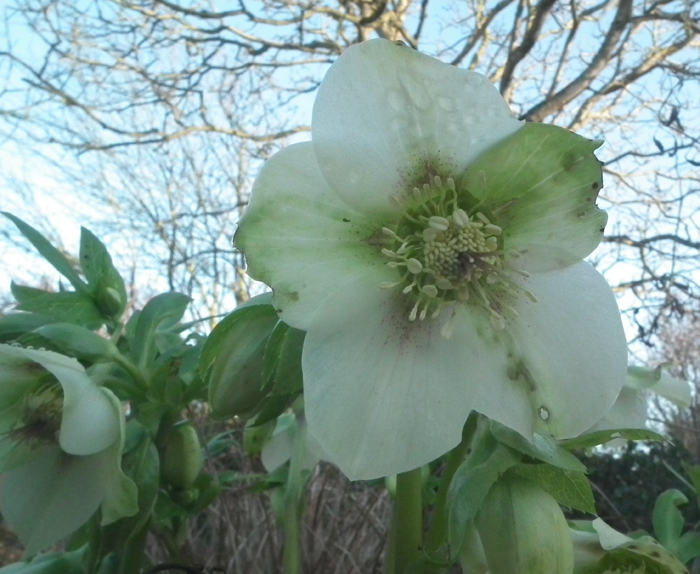 We don't normally get them in bloom much before the end of February. Following the poor show of blooms last year I did take a lot of care to water our plants a lot during the very dry summer of 2011 and also fed them with Miracle Grow plant feed for ericaceous plants which seems to have done the trick... more pics to follow as they bloom! 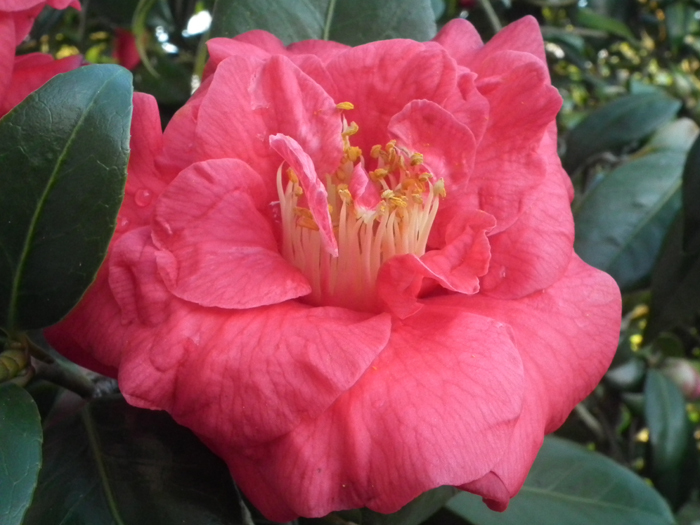 This little Camellia - sasanqua "Evangelica" was the first to flower in late December - smaller blooms than many of the other varieties and SO pretty. Amazed to see that we've got Campanulas blooming in January - v. unusual! The winter flowering Honeysuckle is a must for any garden - this is a great plant for anyone wanting to spoil the bees who don't exactly have a great source of pollen in January. 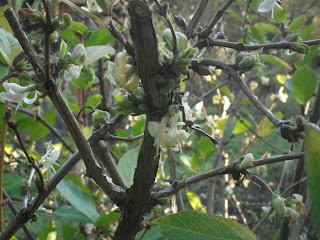 This shrub looses most of it's leaves in autumn and then produces a mass of pale yellow/cream coloured small but amazingly fragrant flowers in January - it flowers for at least 2 months. 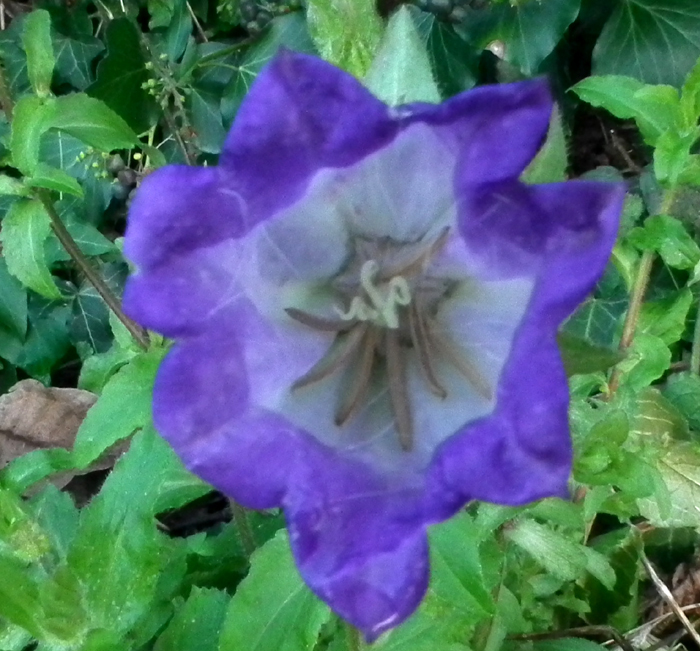 Now that this has grown somewhat, I'm planning on growing a clematis through this to give some colour later in the year too. 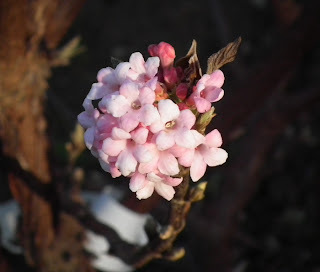 Another favourite... Viburnum x bodnantense "Dawn" - another shrub producing incredibly fragrant blooms on bear stems at this time of year but be warned it does not like to be too dry - best given a good layer of mulch to help prevent it drying out in summer! 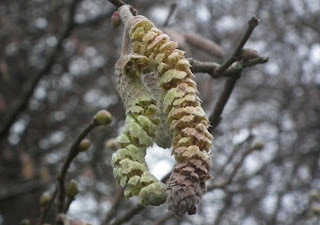 Catkins on their way out already. 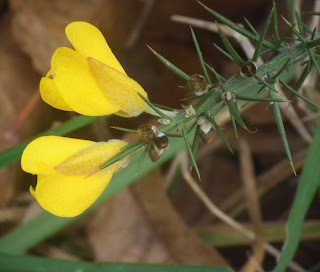 A mass of bright yellow Gorse that I spotted out on a recent walk. 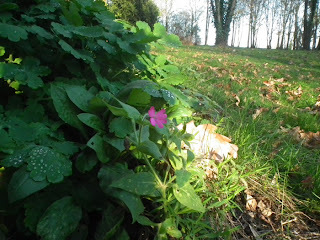 Even the odd clump of vivid Red Campion is flowering in our woodland. 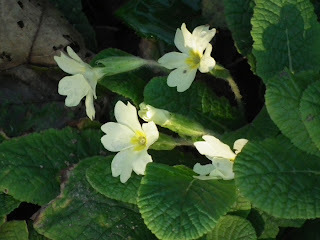 Little pale yellow primroses have also been out since the beginning of January which is something I've not seen here before. 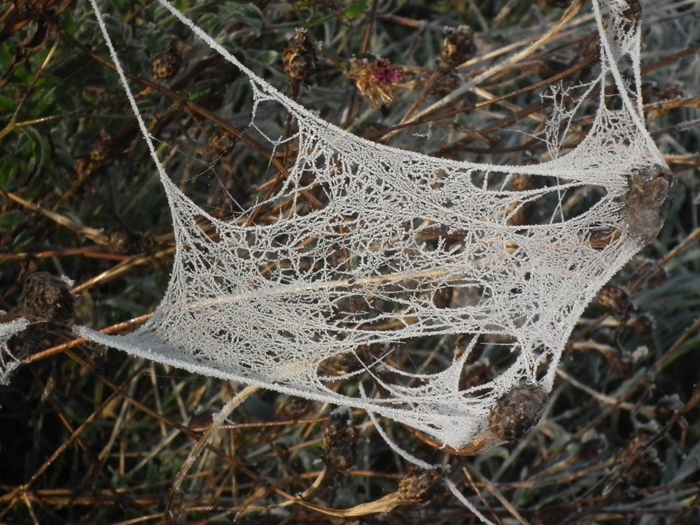 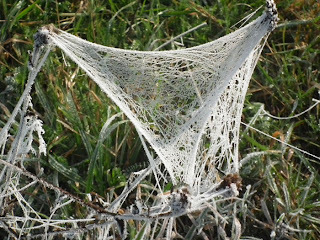 And then came the cruel frost of about a week ago now ... an amazing morning for a walk as well - I've never seen so many frozen cobwebs which seemed to envelop much of the plant life either side of the track that I was walking on... an incredible sight and one difficult to catch on camera in the bright morning sunshine. 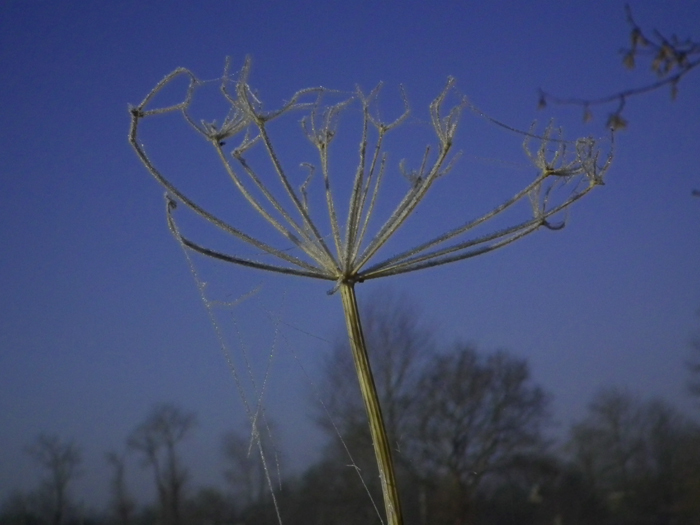 I did go a bit mad on the photo taking but it was so beautiful I wanted to take as many shots as I could - all said and done I'm not sure they do the whole spectacle justice but I hope you enjoy them! 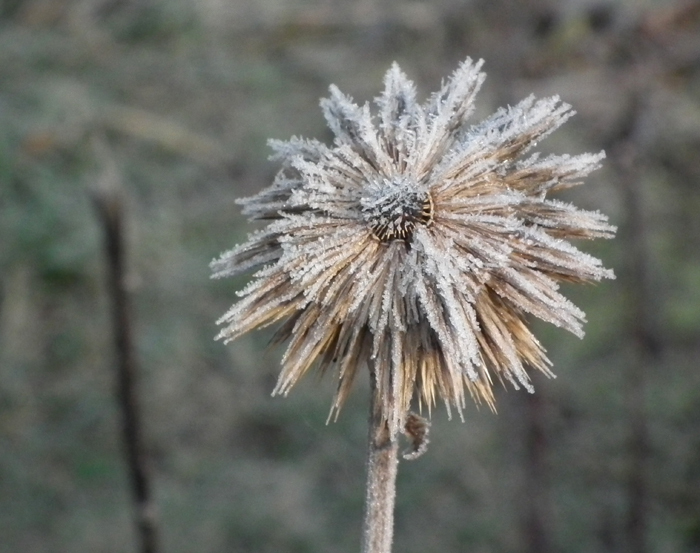 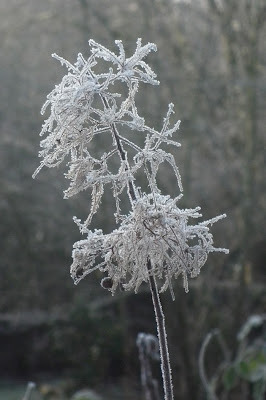 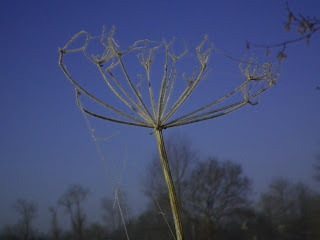 Back to the confines of our garden the remains of the Echinops seed heads also make interesting frosted photos too. also for its' pretty flowers - normally showing in mid spring... but unfortunately these blooms didn't last long with all the frost. 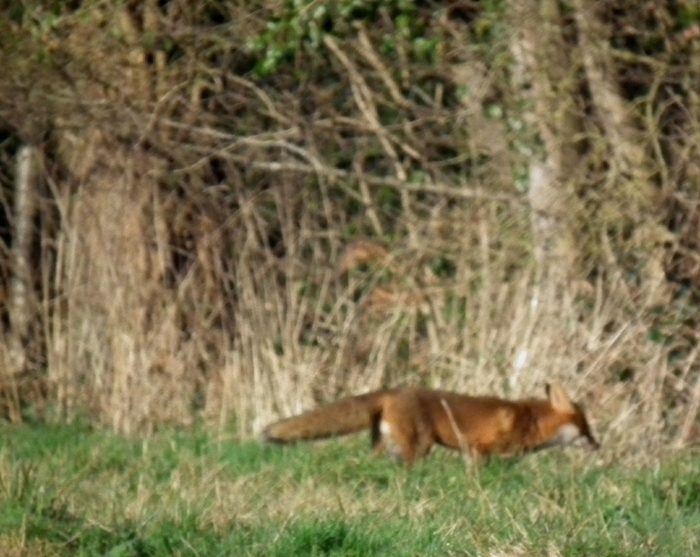 I couldn't do this posting without adding these of the fox that I spotted on my walk as well - v. exciting but a shame it wasn't that bit closer. 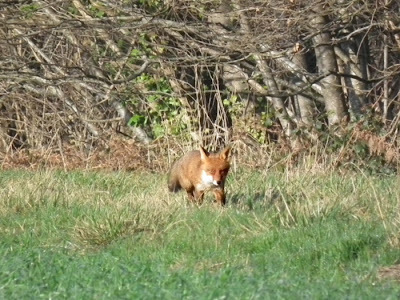 The wooded area behind the fox stretches for quite a distance along the bottom of the fields and there's quite a drop below to a small river. 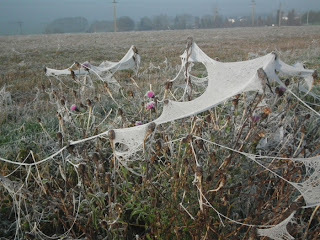 There are masses of holes all along here - obviously quite an active series of dens. 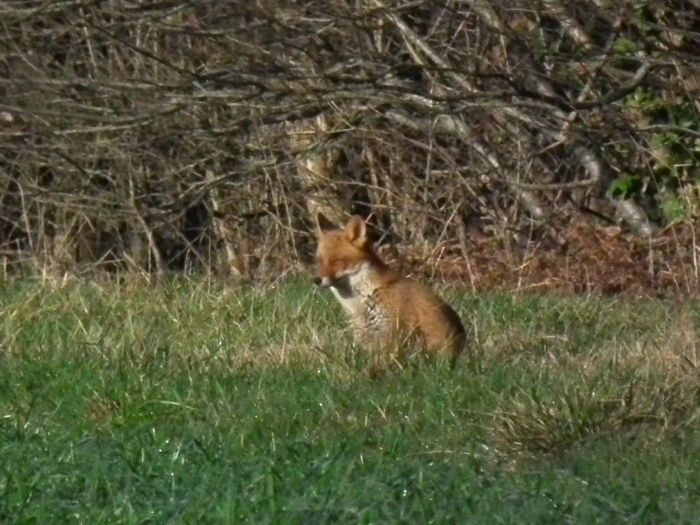 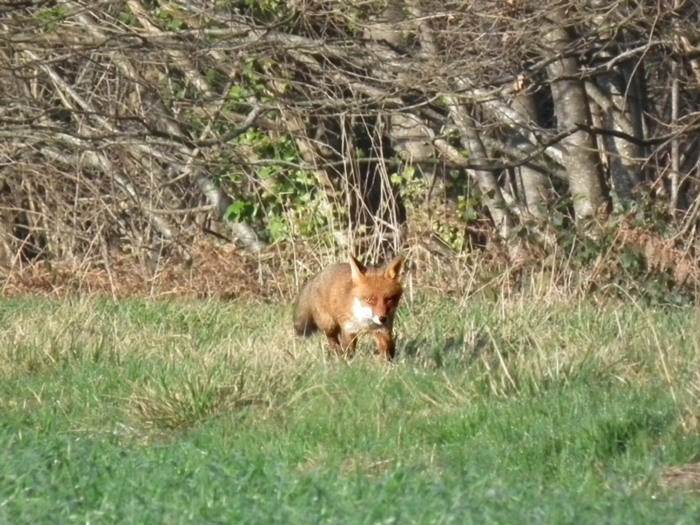 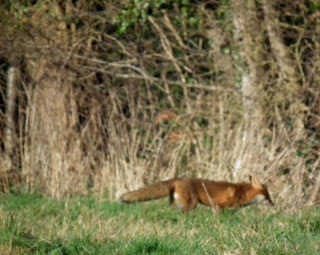 We walk along here quite regularly but it's not often you see a fox in broad daylight. 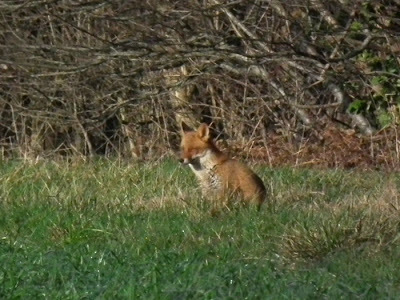 Unfortunately once the fox had spotted us it made a speedy exit... hopefully I'll get the chance to take more photos in the weeks to come!